Lightweight and ready for anything. Toss it in a backpack or bag. Pick up one for each class or project. 10.5 x 8 inch sheet size. 1 subject notebook has 70 wide ruled sheets. 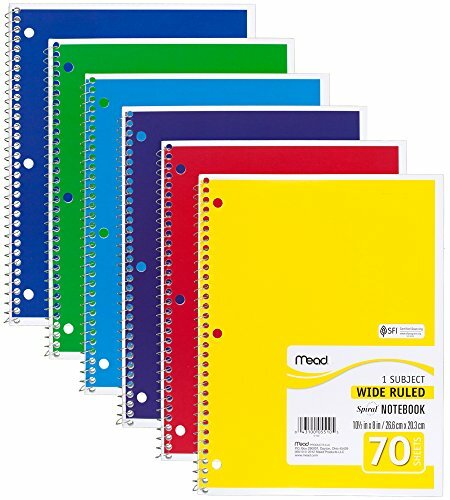 The assorted color 6 pack includes Yellow, Red, Dark Blue, Purple, Light Blue, and Green. 3 hole punched spiral notebook fits easily into a binder. Sheets tear out easily. 3 Pk, Bazic College Ruled 3-Subject Spiral Notebook, 120 Sheets, 10 1/2" x 8"